So, I’m a little late to the blood orange party this year. I’m a little late to everything at the moment, actually. Let’s just say this past week has been like swimming through treacle. And let’s just say, I find swimming through water difficult enough. I feel like I’ve had so much on my plate recently and I’ve been spreading myself too thin. I’ve never learnt how to effectively manage my time properly and it’s all been catching up on me. Not to mention, I’ve really been struggling with my relationship with food lately, trying to decipher exactly what I should and shouldn’t be eating and as you can imagine, that’s rendered my creativity this past couple of weeks to about zero. Which, to add insult to injury, is when the comparison gremlins start to rear their ugly faces and the overall effect is that all I want to do is run and hide away. Oh yeah – it’s been a fun week. But! I made it through and here I am at the end of the tunnel with a smile on my face. Yeah! The stresses and strains I’ve been experiencing this week will be the focus of some posts I’m planning on writing for a new blog series in the not-too-distant future. We’ll be talking emotional well being, learning how to eat well and staying out of the comparison trap. I’ve learned a lot over the past few years and I’m still learning – and failing and learning some more – every single day. I’d like to share some of that work-in-progress journey with you. That’s about all I’m going to say about that for now but do watch this space! Like I said, I’ve been slow to get my act together this week and so I admit, I’ve been sitting on this recipe for a little while. 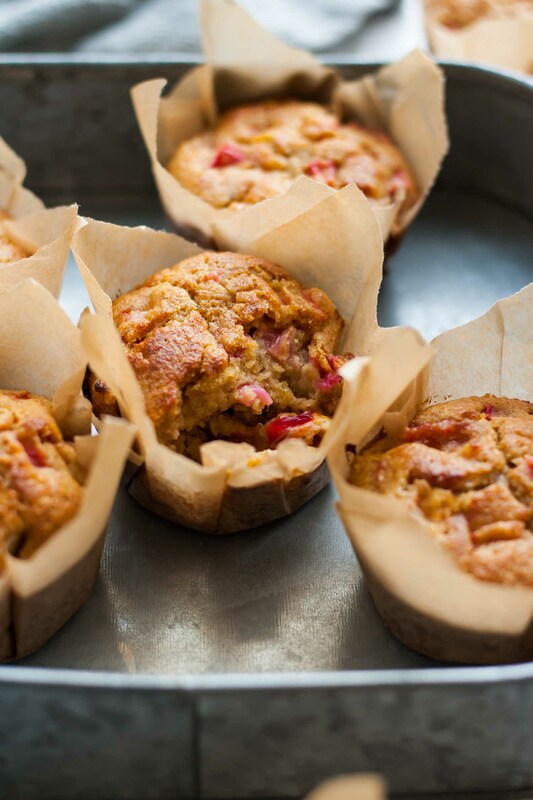 I just had to share it with you though because Blood Orange Rhubarb Muffins. What more do you need to know? I know we’re nearing the end of blood orange season but it is still possible to find them, just! And if not, you could always just sub a regular orange. Forgive me? I promise you that it’s worth it. Plus, rhubarb is still absolutely plentiful and will continue to be so there’s that! 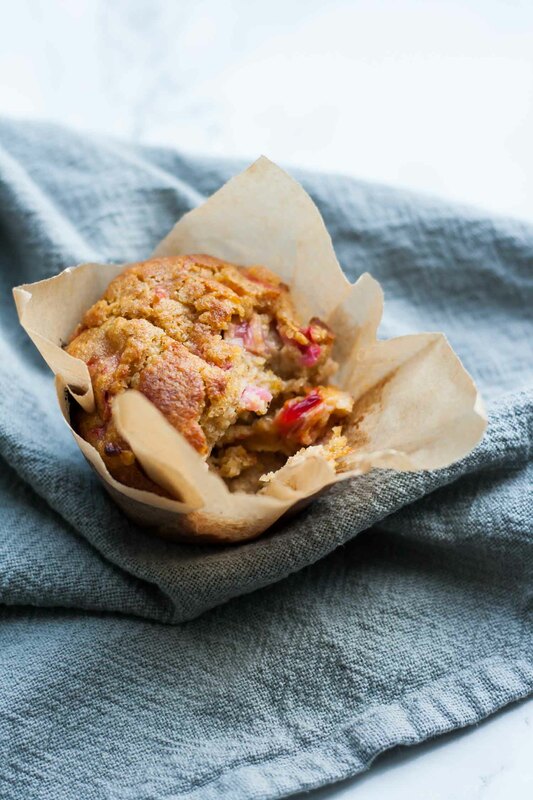 I made these muffins using slender, hot pink forced rhubarb which is so worth it if you can find it (I still can!) and if not, regular rhubarb will be just as good. Just make sure you chop it up small enough so that it has time to cook through. 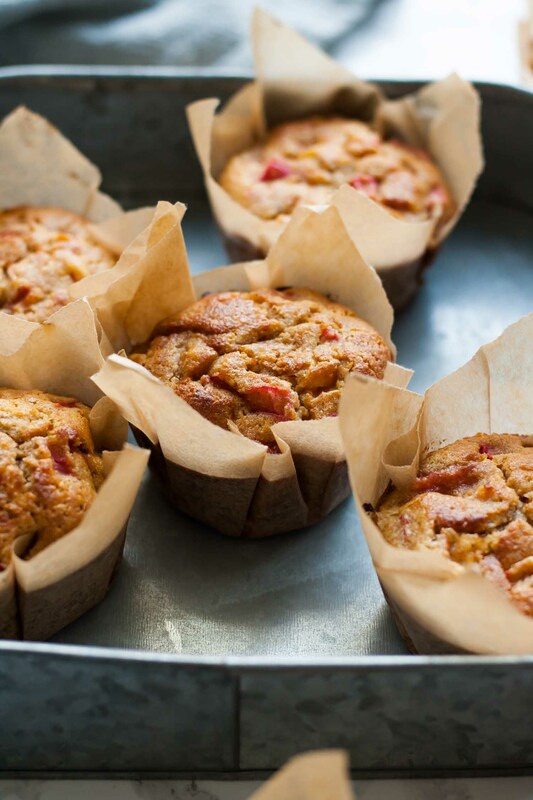 These Blood Orange Rhubarb Muffins are so delicious. 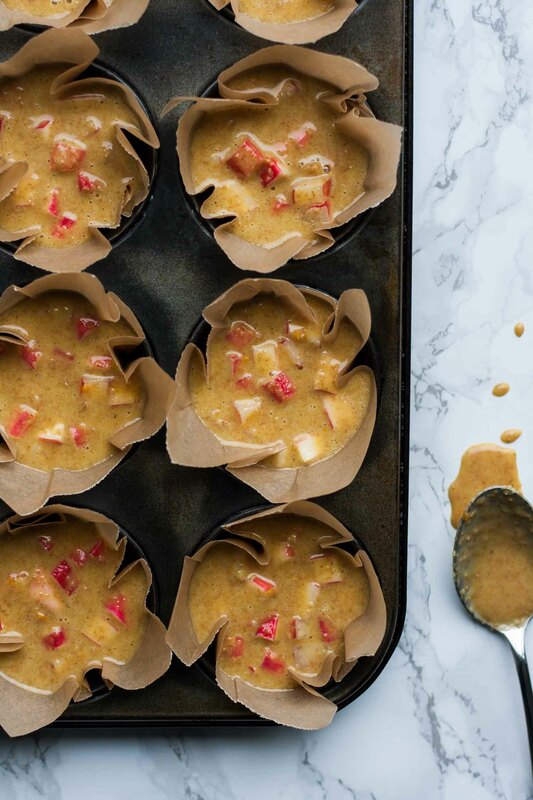 They’re not overly sweet and so would absolutely qualify as a breakfast option (and oh how I love a breakfast muffin) but they also make the best mid-morning or afternoon snack. 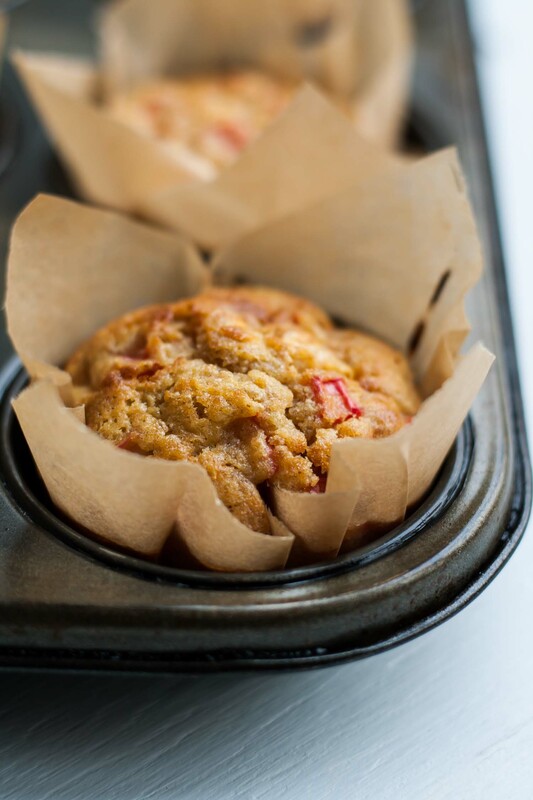 The muffins are gently spiced and nutty from the spelt flour and ground almonds. 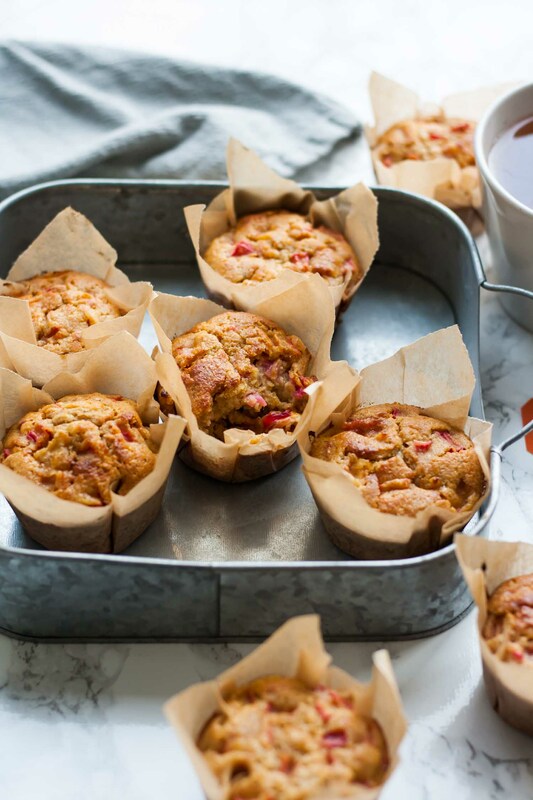 And then they’re studded with tangy rhubarb and blood orange pieces, which ensure the muffins are super moist and downright irresistible! 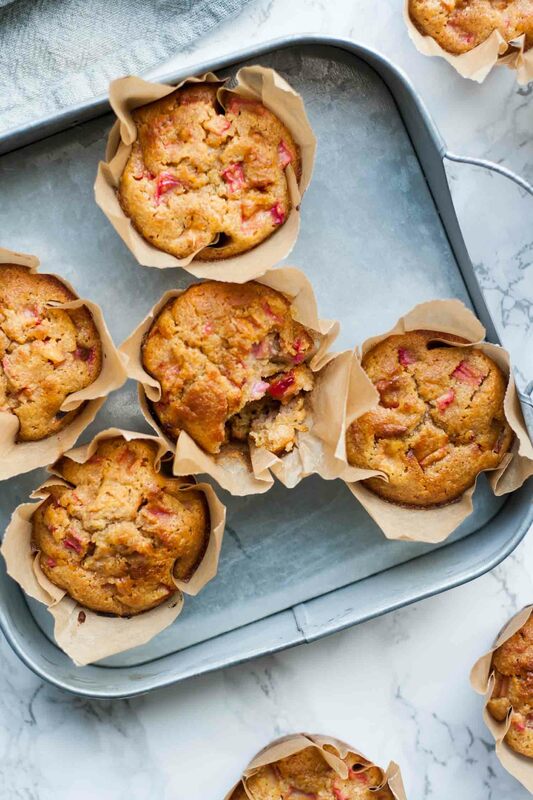 These are the perfect muffins to bake on those days when you just need a little win, when mixing together a few good ingredients and creating something wholesome and comforting is just what you need to do to wind down a little. I love recipes like this. I love all kinds of cooking but there are times when even I want to cook with minimal effort yet still get to eat something amazing. This recipe ticks that box for sure. I hope you love them too! In a large mixing bowl, stir together the spelt flour, ground almonds, baking powder, ground cinnamon, ground ginger, salt and light brown sugar. In a smaller mixing bowl or jug, lightly beat the eggs with the milk and oil. Add the wet ingredients to the dry ingredients and mix well with a wooden spoon or spatula until combined. Finely grate the zest of the blood orange and add to the batter. Chop off each end of the orange and stand it on one end. Using a sharp knife, carefully remove the skin and pith from the orange. Dice the flesh of the orange, discarding any seeds. Finely chop the rhubarb into small dice and add it to the batter along with the orange. Stir until the fruit is evenly distributed. Divide the batter between 14 muffin cases and bake for 25-30 minutes until puffed up and golden and a skewer inserted into the centre of the muffin comes out clean. Leave to cool. these look so delicious, moist, and springy! They really are lovely, thank you! Beautiful photos! These look amazing for breakfast. Aww thank you so much Amber! They would be so good for breakfast! These look amazing. Blood oranges give these such a great color and are sweet enough to make the rhubarb sing. Now I a new way to use the rhubarb in my garden! Thanks for such a creative recipe. I’ve been wanting to try using rhubarb in a recipe as I never have, and these look like a great place to start! Oh I definitely recommend it! You really need to try rhubarb soon, it’s so good! !